This photo is of a rainbow from the 5th of October. 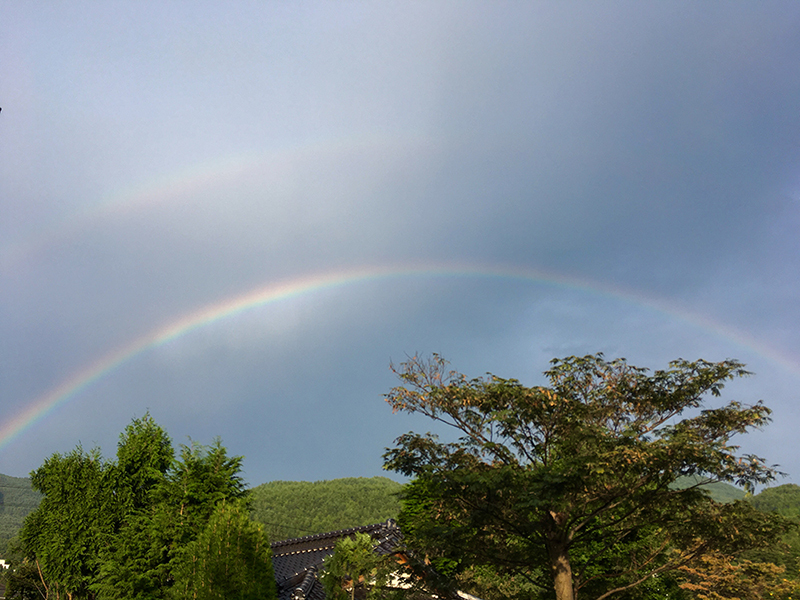 While I have been staying in Omachi, especially the first twenty days, it rained like it would never end so I was expecting more rainbows to appear, but in fact this was the only time. It is a clearly arched double rainbow. I recalled the rainbow in the anime . It powered out of the land, and poured out like a flood. I had never thought of that before, so I felt beaten to the idea. Since then, when I see a rainbow I can’t help but imagine the root. I want to go to the root of a rainbow someday. Do rainbows have regional uniqueness? I don’t know, but it doesn’t feel like they do. For many people, rainbows are not significant. In fact, the one on the 5th of November attracted little interest among the people I told: “oh yeah?”, “I see”, “alright”. That kind of reaction. In the olden days it was mysterious enough to be a source of myths in many places, and carried connotations of bows, snakes and dragons, but as time went by it was recognised as a common physical phenomenon and the status or rainbows – at least among half of the people I know – has fallen to its lowest. If you draw one, it is indeed a symbol of peace, of a gentle and airy atmosphere. No complicated theory matches that. Happy Nothing Day.